Louise McCay explains how learning disability community nurse Lisa Harris helped her son Conor reach a diagnosis for a rare condition. 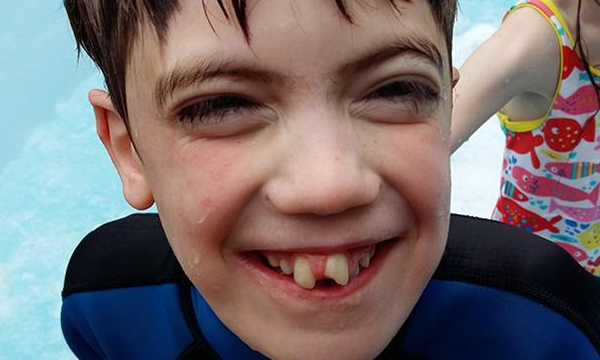 Conor McCay was diagnosed with a rare genetic condition called Cornelia De Lange Syndrome. My son Conor is an 11-year-old boy with a rare genetic condition called Cornelia De Lange Syndrome and complex needs. We have encountered many medical and nursing staff on our journey, but learning disability community nurse Lisa Harris, who works for the Western Health and Social Care Trust in Derry, Northern Ireland, stands out. Before we were referred to Lisa, we, as a family, were struggling to manage all the aspects of Conor’s needs. He has a history of tonic seizures, coeliac disease and had undergone several operations for cleft palate repair as well as a hamstring and heel release. We were concerned that Conor was unwell and in acute pain. He was self-injuring, which was not a previous feature of his personality or behaviour. It was difficult to have Conor’s needs met and coordinated, and we felt that we had no lifeline. Lisa was that lifeline. She embodied everything an outstanding nurse should be – the light at the end of a dark tunnel, the voice on the end of the telephone. She helped us seek a further diagnosis for our child, which we hadn’t been able to achieve, and she walked alongside us for each step of the process. She kept us updated and informed, while pulling together all the necessary professionals needed to help with Conor’s medical needs. She liaised with us and with Conor’s school and the hospitals, but most importantly Lisa listened. She understood what we were going through and we felt she genuinely empathised. She was an amazing advocate for our child, who is non-verbal and was in daily pain. She is professional, with the added bonus of being a lovely, truly caring individual for those in need of her support and expertise. She diligently pursued the diagnosis until we came to the end of the process, which has meant a better quality of life for our beautiful child. None of this would have occurred without Lisa’s persistence and approach. She is the type of nurse every parent with a vulnerable child should have on their team.